A friend of mine recently asked me if I ever get tired of being a Christian. To be honest, I immediately had an response in my mind, but I hesitated to say it. I then just looked at her and said “yes”. I could see in that moment, my friend was weary. Life’s events and family battles had brought her down. She needed hope and encouragement. While talking with my friend, I was reminded of a weary time in my not too distant past. A time when Hope had no meaning to me. A time when I was tired of being a Christian. It was one of those times where I just felt alone. A time when I just wanted to be left alone. I’ve been a believer a long time, and I knew what I needed to do to refresh my weary soul. But I didn’t have the energy to do it. I looked my friend in the eye and I told her that with everything that’s been going on in her life my guess is that she’s been trying to do life alone . Over the last couple of weeks, the devotions that I’ve been reading have had the same theme. The theme of being weary and worn and finding a quiet place of peace where we can refresh our soul. It’s so interesting how when God wants to share something with you he shares at multiple ways, you see it everywhere. I took a screen shot of what I read on the first five app this week. You can see it below. As I read that little passage, what stuck out to me most was the part at the bottom. The writer says, “we have the opportunity to process life’s challenges with him and be completely honest in our raw emotions”. I stopped at raw emotions because sometimes, that’s where I am at. My emotions are just raw and the last thing I want to do is share them with anyone including the Lord. If you continue to read it says, “we gain wisdom and direction to make important decisions”. I want to gain wisdom. Wisdom to seek peace when I am weary. To seek calm when I am stressed. To seek hope when certain situations seem hopeless. I need to find a quiet place where I can calm my mind and just be bare and laid open before the Lord, so that he can correct those character flaws in me and give me wisdom. With wisdom comes peace and hope and joy. I don’t know about you, but my biggest problem is doing that every day. I don’t take the time to go before the Lord completely open and bare before him. And when we don’t seek that every single day, that’s when life gets weary and overwhelming. That’s when we feel like we are tired of being a Christian. We’re trying to live life alone. It’s easy to do. Life seems to be coasting along just fine. No real challenges or issues. Just the every day norm. We get busy. We get distracted. We forget. Then WHAM!! We get hit with car trouble. A leaky roof and a vet bill. AND it’s Christmas. That literally happened to us last year. I had made sure we had plenty of money for Christmas and with in a couple of days it was all gone. None spent on gifts. I was so angry. It took me about two days, but I had began to pray. I prayed the Lord would help me not be angry over the money. That he would help me to be content in the current situation. I prayed he would provide for Christmas. As the change occurred in my heart, Joy and Peace took the place of anger. We had a lovely Christmas. Nothing too extravagant, but lovely just the same. The issue was with my heart. I wasn’t as close to the Lord as I should have been. I wasn’t relying on Him to provide for Christmas. I had tried to manipulate the system and I lost. In the end I gained something so much more. I gained Peace, Hope, Joy, and contentment. I gained faith. Praise the Lord. So much that happens in life is due to our choices. I’m not saying spending time with the Lord is a magic fix to all our troubles, but it certainly will give us peace. The Lord may not change the situation at all, but our heart will change. Our mind will change and we will find contentment. Making it our daily choice to intentionally spend real, quality time with the Lord will being peace, hope and joy. If you feel as though you’re “tired of being a christian”, examine your prayer life. 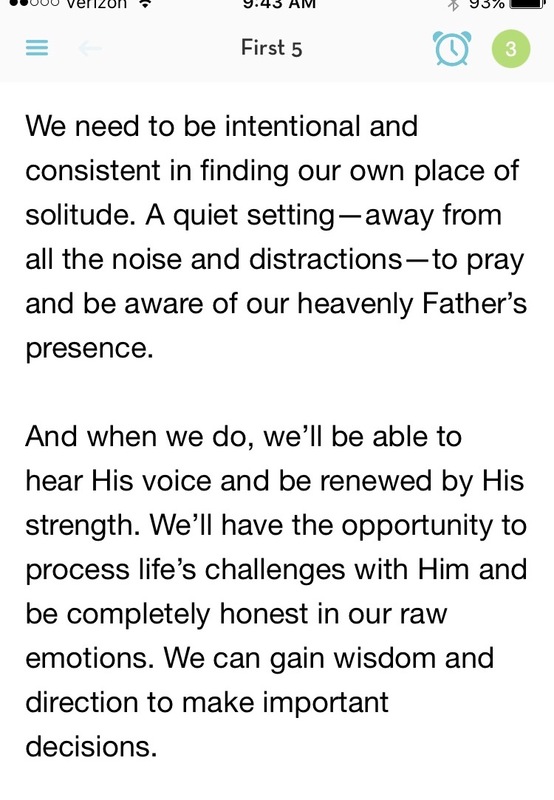 Your quiet time with the Lord. Are you reading devotions to help you grow? Are you reading some of the Word everyday? Are you intentional? If not, make a plan. Make some real changes. Get up 30 minutes earlier. Shut down the screens 30 minutes earlier in the evening. Read the Word after supper with your family. Purchase a new devotion or attend a bible study. Whatever it takes. I pray you will find Peace, Hope and Joy.